Jim and Cindy Green are a couple struggling with infertility. For a long time, they have invested their emotions, their effort, and their dwindling finances into trying to have a child. After their arduous efforts fail, they find themselves sitting across from their infertility doctor, who sheepishly tells them that they have exhausted their options, and that pregnancy will not happen for them. They are devastated, but decide to spend one last evening dreaming about who their child would have been, in an effort to mourn and move on. 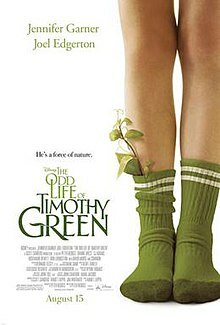 Disney magic happens, and their dream son, Timothy, grows up overnight from their garden. He has leaves on his shins. He also has a navel, but I’m not sure why. Jim and Cindy spend the next two hours or so adjusting to having a son, working through their feelings towards other parents they have known, and by their own admission, making mistakes. 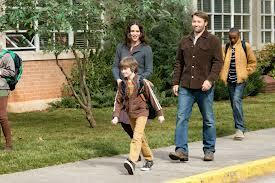 Timothy disappears, but encourages Jim and Cindy by telling them that they were always ready to be parents. 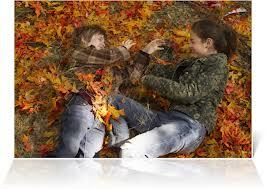 A year passes, and Jim and Cindy decide to pursue parenting through either adoption or foster care. Jim and Cindy have struggled with and grieved their infertility. They “couldn’t have tried harder.” After learning from their doctor that their journey with fertility treatments was at its end, Cindy wanted to just close the door to the nursery, forget it, and move on. Jim said that he couldn’t just move on. Together, they wisely chose to take time to explore and express their dreams about their dream child. Infertility is a loss, and losses get processed better if we take time to acknowledge them, talk through them, and move forward. Processing their loss will likely help them fully accept whatever child does eventually join their family. Jim and Cindy set a model for allowing time to pass on the journey to healing; although not directly stated, it seems that they spent a year or so reflecting on their experience of parenting Timothy before pursuing adoption anew. Cindy’s sister is an unfortunately accurate portrayal of some people’s attitudes towards kids being raised by parents who did not bear them. Cindy’s sister wonders how someone could love a kid who isn’t their “real” kid, and also cautions Cindy that children in these situations might have issues. Cindy’s responses to her sister are commendable: Timothy felt like my real child from the first time I saw him. If he happens to have issues, we’ll work through them, just like any parent would with any child. Jim and Cindy are very much helicopter parents. Their over-protective and over-involved approach towards Timothy makes sense – they have wanted to be parents for a long time, and they also want to correct their own family dynamics; Jim wants to be there for his son in a way his father was not present for him, and Cindy wants to have a thriving child so she can brag back to her overly-bragging sister. Both want to earn vicarious praise through Timothy, and this results in them trying to develop him into an athlete, to cultivate his image as a musician, and to advocating a bit too strongly on his behalf to a soccer coach. Others’ reactions are helpful, though. Timothy lets his parents know that he can handle the first day of school. The soccer coach speaks the thoughts of many: Oh, you’re not those type of parents, are you? It seems that Jim and Cindy have learned, though. While talking to an adoption social worker, they express that their understanding has changed; parenting is making mistakes, and improved parenting means making different mistakes than the ones you’ve made before. They seem to have developed a healthier, less-stressed attitudes towards parenting. Jim and Cindy encourage Timothy not to share his differences and story with their (and now his) extended family members or with his friends. They initially explain that some people might not understand his differences, but later seem more intent that no one find out about his differences. This seems to mirror fears that some adopting parents have about discussing adoption with their children and with their families. Secrets are sadly a part of many adoptive family’s lives – secrets might be kept from friends, from family, or even from the child. Secrecy is shame-based. Confidentiality is somewhat different; while secrecy holds that a story can’t be shared with anyone, confidentiality allows the parents (and the child) to share their story with people they find to be trustworthy. Timothy’s secret helps the friend feel comfortable with him. As she puts it, Timothy is not the only one with a secret. The Greens’ appointment with their social worker is terrifyingly bad, and it probably plays into the fears that many potential parents have of the adoption process. The Greens are given one hour to convince a stern, adversarial social worker (and her almost wordless assistant) that they should be given a chance to be connected with children. I’ve worked with many adoption social workers, and have conducted hundreds of interviews with prospective parents. Interviews are often very informal, friendly, supportive, and educational. They’re usually longer than an hour. This movie seems most likely to appeal to families with children between the ages of five and ten. It could also be helpful as a discussion starter for couples considering adoption, and for couples who pursued adoption after discovering their infertility, looking to help an adopted child begin to understand how they began to consider adoption. Have we discussed our desire to adopt with our families? What has their reaction been? What will our responses be to negative comments that our friends and family members make to us about the children we adopt? What will our responses be to those comments if the child has heard the comments? What are our dreams for our child? Do they leave room for the child to be his or her own person? Do you ever get teased by kids at school? What do they tease you about? How does it make you feel? Do you ever feel like there are secrets we make you keep from other people? Are there things you feel like you can’t tell us? This review previously appeared on Adoption at the Movies in 2012. Want more adoption movie reviews of kid-friendly films?